• Contains 12 examples that are completely new and have been used by student groups. • The chapter on difference equations is new to this edition. 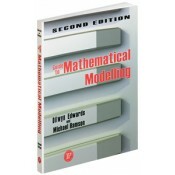 • Presents modeling methodology in detail and includes the essential skills for producing a successful model. • Provides coverage of ‘discrete’ models where the outcome is needed at discrete time intervals, such as hourly, daily, and yearly. • Investigates models in which the variables are continuous functions of time, such as often occurs in physics and engineering problems. • Covers problems that include a random feature that demand some statistical analysis. • Presents a collection of more demanding examples, some of which are fully developed while others are left for students to process. • Offers a chapter on communication skills, enabling students to explain the ideas behind the model to other people.